The seller on ebay sold me a camera and this lens and he said that it was in good condition but not sure if working. Can I get a refund?? IS IT EASY TO FIX? HOW CAN I TAKE REAR END OFF ON TAKUMAR 50 1,4 LENS??? ANY CHANCE IT COULD BE SOMETHING ELSE? i believe the small white spots are all dust, so that's not an issue, but not sure what big white spot is! From this picture it looks like exterior dust on the rear element. A few stray dust particles inside here and there is perfectly normal, especially for a lens this age, and will probably have very little/no noticeable effect on your pictures. It would help if you could take another better picture, focused on the spot you are referring to and blow off any dust that is on the exterior of the rear element (Giottos rocket blower is a great tool to have). I do not think it is possible to tell from that image. It could be fungus or just dust, as noted by Julie we need a better image. It would also help if you posted images correctly according to the forum rules. Your image covers several screens on my 24" monitor and is simply unmanageable on my tablet. Here is a link to the rules on posting images. If you need help downsizing the images just ask. It really is very hard to read your posts with the images like that. If it is fungus, I have taken several Takumars apart for cleaning so I might be able to walk you through it. However, since you just bought it and the seller described it as good condition I would request a refund. There are lots of those lenses out there, no need to accept one that is not up to par. But post a clear image so we can see first. From this picture it looks like exterior dust on the rear element. A few stray dust particles inside here and there is perfectly normal, especially for a lens this age, and will probably have very little/no noticeable effect on your pictures. It would help if you could take another better picture, focused on the spot you are referring to and blow off any dust that is on the exterior of the rear element (Giottos rocket blower is a great tool to have). Thanks for the prompt reply, you're awesome! Sorry, pic was taken with iphone which cannot macro focus!!! I'm not able to blow off as I don't have a blower right now and the last thing I want is to scratch the glass. I lost the cable to connect my camera to my computer, so that is a pretty big issue... Forced to take pics with my iPhone for now. I'm sorry, I did not know there was such a rule. I would much rather repair it myself than send it back to the seller, it presents a lot of trouble and that would mean I would have to waste a lot of money just to ship it back. I'm a student/teenager and every 1$ counts. I cannot afford to loose money on something so simple. Nicole, lens repair is NOT simple. Takumars are possibly one of the easiest to work on but you do need proper tools and a bit of knowledge. I'll be glad to help but lets make sure it is fungus first. Also, if it is fungus it may not be possible to clean at all. Depending on the type of fungus, how long it was alive in the lens and what it had to eat it may either wipe right off, or it may have etched the glass so that the lens is useless. Also on some lenses it can be in the glue between optical elements in which case it is impossible to clean. I have cleaned fungus from a number of lenses, it can be done, but in some cases it is not worth the effort. But lets make sure what the problem is first. Please post several clean clear pictures of the lens, if you can try shining a small flashlight through it as you take the image. OK, looked at the pictures. To be honest I still cannot say for sure. If I had to guess I would say it looks like water spots or something on the outside of the rear element, I just cannot tell. If you have a small flashlight try shining it through from the front and see if you can determine which lens element and which side of the element the spots are on. Do you have eyeglass cleaner available? And a microfiber cloth? terrycloth will do if you are careful, but never use paper. Try gently wiping the rear element with the cleaner, just a little at a time to see if the spots can be removed. If they are on the outside then you should be able to clean them, another thought would be to take the lens to your local eyeglass store, and smile nice to the lady and she might clean it for you. The bad news is that if the spots are on the inside of the rear element it is a long way in to get to it. Takumars are built from the back forward, to open them you take off the front element and disassemble toward the back. In this case the rear element is the last thing you take out. You have to go through the aperture mechanism to get to it. I have never gone that deep, the lenses I've repaired had issues on either the front or second elements. 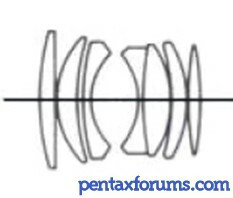 Here is what the elements of that lens will look like inside, front element is on the left. Fungus spores are in the air all the time, and present inside all lenses. They just do not usually grow. If the right conditions are present then it can grow almost over night. It needs warmth, moisture and food to grow just like everything else. Usually what happens is the lens get wet, and gets some water inside. The fungus starts to grow but quickly runs out of either food or water and dies. If that is fungus it probably grew and died years ago. If it was still growing the whole lens would be covered, just like a slice of bread that gets mold, its the same thing almost. You're amazing! +1 like to you! Very good detailed info, I'm guessing it must have died, it looks like it's on the outside, maybe some kind of liquid, but not sure. There's a little dot in the center, so I'm thinking it's most likely a fungus or some kind of mold. Hopefully, if it's on the outside, I'll be able to clean it off but I kind of doubt it! I got the lens for 77$ incl. shipping with a probably-non-functional pentax esii so I didn't loose too much money, and everything looks great, not too many scratches. I just hope that fungus won't grow!!! BTW: If you made a youtube video demonstrating how to disassemble a few of your lenses, I'm 100% sure you could get A LOT of views. If I knew how to or if I were brave enough, I would make video tutorials. Give that a try and let me know what happens. If it is on the inside, I would return it and start over. I do not think it would be worth the effort, the hard part is getting past the aperture and then getting it back together correctly. Much too easy to have nothing but pieces. Would have no idea how to shoot video or do the youtube thing. The last thing we need is more random clueless people taking apart lenses, I've already had to correct enough stupid things done by previous owners. Any idea the mess that is caused when someone tries to "lubricate" a focus helicoid with WD40? How do you know jatrax is clueless? You know what I meant, watching a Youtube video doesn't make someone an expert. Just wipe the rear element with an old cotton tube sock, damp with a little rubbing alcohol. 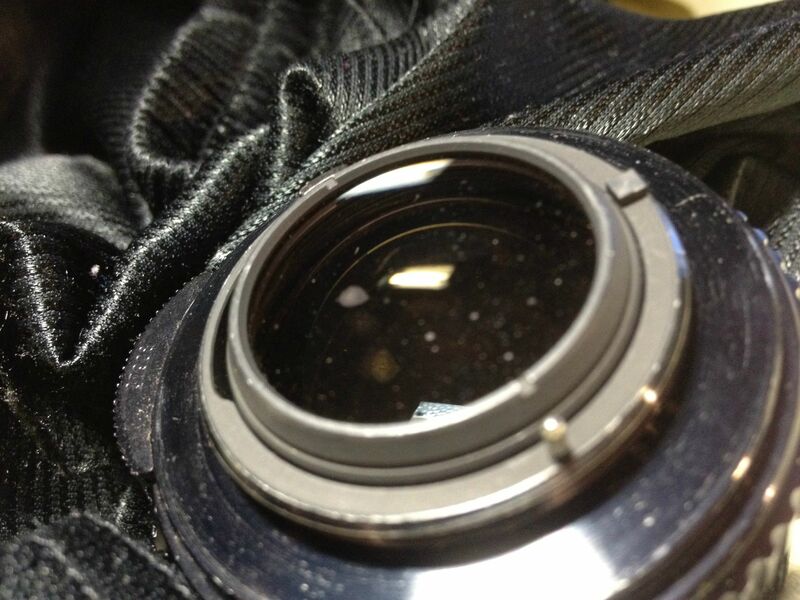 That won't clean the lens perfectly, but it will show you if those spots are on the outside or the inside of the lens. Honestly, you're not going to damage the lens. I used a cleaning cloth from my ray ban glasses, it's not coming off so I'm assuming it's on the inside. Any possibilities it is not fungus?